Hogrefe is a leading psychology publisher based in Göttingen in Germany with subsidiaries in many European countries. The two key goals of Hogrefe’s new XML workflow for book production are to produce electronic products at the same time as the print products and to maintain XML data that is compatible with the NLM / JATS industry standard. The continued high commercial importance of printed books is taken into account by the fact that the books are still mostly typeset in InDesign. For acceptance reasons, the company did not want any changes made to the classic author proof based on a first pagination. This condition, combined with the relatively high complexity of the XMLs and the layout requirements, makes an XML first workflow with InDesign seem very problematic. However, subsequent conversion is not without its problems either. 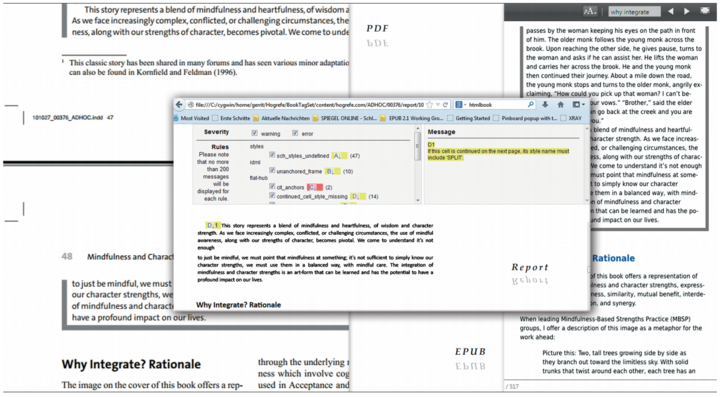 The solution is firstly to define style sheet names and other conventions across all series, and then run an intensive automatic check after each conversion step to detect unanchored images, impermissible styles and uncited references, as well as more subtle aspects such as inadequate markup of tables that span more than one page, table cell splits or table footnotes. The solution is a subsequent conversion process, therefore, but with extremely detailed checks and error correction by the typesetter before print approval.